Kennett Square Police Chief Edward A. Zunino (left) discusses the arrests as District Attorney Tom Hogan listens. 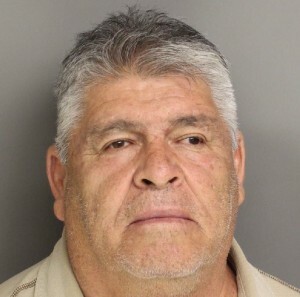 The 65-year-old Mexican native who became a U.S. citizen and ran a landscaping business from his rented home in East Marlborough Township lost a son to drug-trafficking; however, that did not stop him from running a major cocaine cartel, authorities said on Wednesday, May 28. 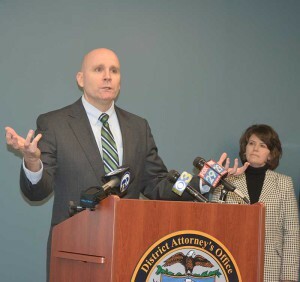 Announcing “the largest drug prosecution in the history of Chester County,” DistrictAttorney Tom Hogan held a news conference to detail the arrests of 44 members of an international drug-trafficking operation headed by Salvador Lopez Lemus. The “family business” is estimated to have distributed more than $100 million worth of cocaine over the past two decades, Hogan said, adding that warrants were issued for 16 other members. Hogan said southern Chester County provided an ideal locale. “It’s a good place for Mexican drug dealers to hide,” he said, explaining that they can easily blend into the Hispanic population. 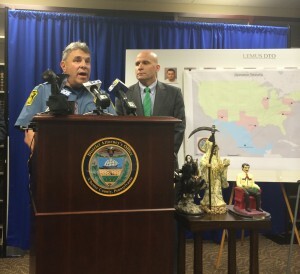 “Just like the airlines have hubs,” the Kennett Square area provided a base from which drugs were shipped to “source cities” that include Phoenix, Az., Houston, Tx., Charlotte, N.C., and Chicago, Ill., Hogan said. He said Lemus – who involved his son Francisco Lemus, his wife Jovita Lemus, his daughter Vivian Lemus, his nephew Mario Herdendez Garcia and half a dozen other relatives in the operation – lively modestly in East Marlborough; however, he spent the winter in Mexico. “Sal lives the high life when he goes back to Mexico,” Hogan said, describing three or four lavish homes. In addition to the items typically seized during raids on drug dealers – cash, vehicles, weapons, jewelry, etc. – Hogan said investigators found statues of Santa Muerta and Jesus Malverde. He said the figures are considered the “patron saints of drug dealers,” and praying to them is supposed to provide protection. “In this case, someone must not have been saying their prayers,” he said. Hogan was joined by representatives from a host of other law-enforcement entities. 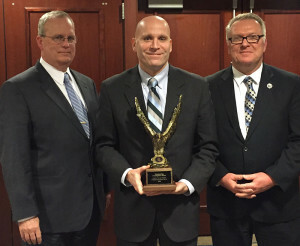 “This was a group effort,” he said. Chester County Chief Detective James Vito said the partners included the Berks County District Attorney’s Office, the City of Philadelphia District Attorney’s Office, the state Attorney General’s Office, the U.S. Department of Homeland Security, the U.S. Department of Justice, the Philadelphia-Camden High Intensity Drug-Trafficking Area program, the Chester County Sheriff’s Office, the Pennsylvania State Police, and police departments from Kennett Square, Coatesville, Oxford, and West Chester. Salvador Lemus was jailed after failing to post $1 million cash bail, court records said. 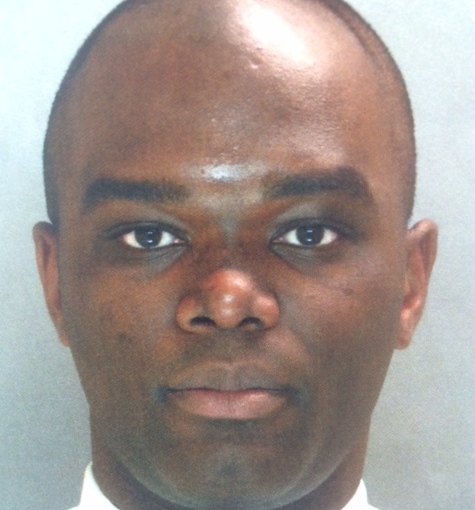 A preliminary hearing is scheduled for June 2, records said. Because of the number of defendants, Assistant District Attorney Christopher L. deBarrena-Sarobe said the preliminary hearings will be held on June 2, June 9, and dates to be determined. He said Magisterial District Judge Matthew Seavey set most of the bails, which range from $5,000 cash to the $1 million for Salvador Lemus. The defendants – and their ages and hometowns if available – are Nicholas Altman, 24, of Kemblesville; Ralph Arroyo, 54, of Philadelphia; Jamie Avalos; Josh Avila, 18, of Kennett Square; Jose Edolla-Avila; Jose Calderon-Zavala, 41, of Avondale; Antonio Espindola-Severiano; Ernesto Fragoso, 42, of Coatesville; Vicente Garcia-Guzman; Efren Gomez-Guerra; Mario Hernandez-Garcia, 43, of Kennett Square; Alvaro Guzman Tenorio, 41, of Newark; Jesus Juarez-Hernandez, 27, of Kennett Square; Victorino Lemus-Galindo, 34, of Avondale; Jose Lemus-Guzman, 21, of Avondale; Francisco Lemus, 23, of Kennett Square; Jovita Lemus, 52, of Kennett Square; Salvador Lemus, 65, of Kennett Square; Vivian Lemus, 30, of Kennett Square; Leon Rogelio; Jesus Lopez-Torres, 24, of Lincoln University; Christian Lopez, 23, of West Grove; Kevin Macias, 21, of Kennett Square; Federico Magana-Luna, 29, of Avondale; Luis Martinez-Leon, 29, of Avondale; Ivan Martinez-Martinez, 27, of Avondale; Luis Monzua, 25, of Kennett Square; Adrian Morales, 22, of Oxford; Vincente Murillo-Bedolla, 33, of Cochranville; Armando Nunez-Martinez, 33; Cruz Ocampo-Estrada, 29, of Toughkenamon; Isaro Ocampo-Ocampo; Fernando Pantoja-Froylan; Alexander Perez, 23, of Kennett Square; Alberto Ramirez-Acosta, 27, of West Grove; Jose Rodriguez-Lara, 32, of Oxford; Emilio Armando Romero-Gonzalez, 34; Miguel Salinas Camacho, 31, of Toughkenamon; Jose Tenorio-Naba, 58; Jose Torres-Lopez, 34, of Oxford; Manuel Vazquez-Lopez, 18, of West Grove; Francisco Vazquez, 29, of Kennett Square; Javier Villafuerte, 24, of Kennett Square; and Hugo Vite-Lara, 36, of Coatesville.